Shah’s research focused on the design, construction and validation of a pipeline viscometer, used together with non-Newtonian theory, to investigate the viscosity of C-massecuite. Experimental data was then used to develop a correlation to assist in the estimation of C-massecuite viscosity. Tongaat Hulett maintains an interest in the viscosity of C-massecuite from a process and equipment design perspective as massecuite viscosity is a critical physical property that is used in the selection of pumps and design of piping networks, evaporative and cooling crystallisers, crystalliser drives and reheaters in the C-station of a sugar factory. The research was presented at the South African Sugar Technologists’ Association conference at the ICC in September last year. The paper was well received by the industry and was judged as a “Highly Commended Factory Paper” by the SASTA committee and was also selected for publication by the International Sugar Journal,’ said Shah. Shah is currently employed by Tongaat Hulett’s Technology Group. She believes businesses are facing increasing pressure to operate sustainably and to reduce their carbon footprint. ‘I am already involved in such initiatives but hope to make a greater contribution in this area,’ said Shah. She said she would also like to continue teaching and performing as a belly dancer. ‘I’ve performed in Shall We Dance at The Playhouse which is the most exhilarating experience. I hope to continue to perform as a member of the Shall We Dance cast,’ said Shah. 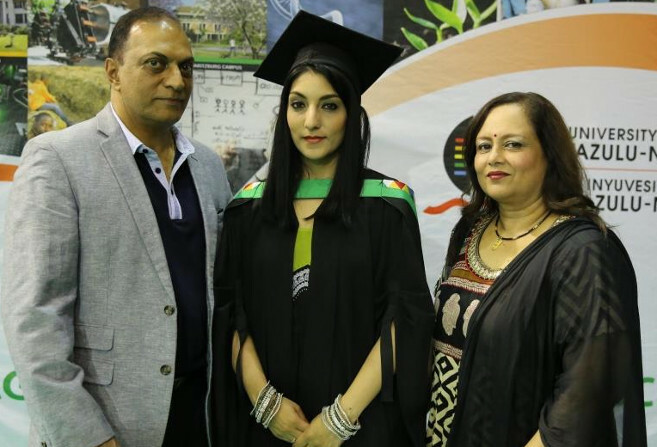 She is grateful to her parents and supervisor, Dr D Lokhat, for teaching her to excel in all that she does. ‘They taught me that life is all about balance and that anything can be achieved with hard work and sufficient planning. My mum completed her PhD in Psychology whilst raising our family and managing her own practice. She worked on her PhD whilst we did homework. It was inspiring and I always wanted to be just like her,’ said Shah. She described her journey in completing her masters as difficult yet rewarding as she was studying part-time while having to manage a full-time job. ‘I completed my studies over five years, with intensive work concentrated in the last three years. However, it was lovely to see the project come together. My colleagues at Tongaat Hulett’s Technology Group and Maidstone Mill were extremely supportive. The team at Maidstone Mill fabricated the water bath according to my design and they allowed me to take over a room in the laboratory to house my equipment for almost a year. The whole experience was extremely rewarding and well worth the hard work,’ said Shah. ‘A career as an engineer is a rewarding one, especially when you are involved in the production of a commodity that you use on a daily basis or in technology advances that will change the world we live in,’ said Shah.